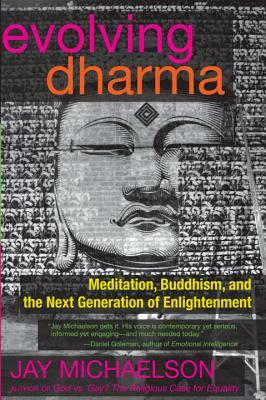 Evolving Dharma is the definitive guide to the meditation revolution. Fearless, unorthodox, and irreverent scholar and activist Jay Michaelson shows how meditation and mindfulness have moved from ashrams and self-help groups to classrooms and hospitals, and offers unusually straight talk about the “Big E”— enlightenment. Michaelson introduces us to maverick brainhackers, postmodern Buddhist monks, and cutting-edge neuroscientists and shares his own stories of months-long silent retreats, powerful mystical experiences, and many pitfalls along the way. Evolving Dharma is a must-read for the next-generation meditator, the spiritually cynical, and the curious adventurer in all of us. Jewish mysticism (Kabbalah) whose work has been featured on CNN, NPR, and in the New York Times. He is vice president of the Arcus Foundation, which supports social justice and conservation worldwide, and writes regularly for the Daily Beast, the Huffington Post, Tricycle, and the Forward. He holds a JD from Yale, a PhD from Hebrew University, and has held teaching positions at Yale University and Boston University Law School. Michaelson’s previous book, God vs. Gay?, was an Amazon.com bestseller and Lambda Literary Award finalist. For more information about his articles and appearances, visit his website. "Michaelson tackles difficult questions about Buddhism’s evolution in Western culture, as mindfulness practice grows slowly but steadily as a popular secular activity. He examines the history of postmodern Buddhism, describes the path of practice and enlightenment through his own personal accounts of bliss and darkness, and considers future directions. Working from the foundational idea that meditation has become a set of tools for the refinement and improvement of the human mind, the author addresses the pitfalls and benefits of the more traditional spiritual/religious approach and its counterpart, the rational and scientific Western worldview...Serious practitioners—secular or religious—and curious individuals alike would benefit greatly from reading Michaelson’s intelligent and compassionate examination of mindfulness practice."